Slip into the comfort and style of the Round Bar Tables; the classic and chic addition to your outdoor area. These robust teak bar tables stand tall at 43 inches off the ground creating an ideal spot to enjoy casual dining while overlooking your beach view or simply adding to a unique home bar experience! 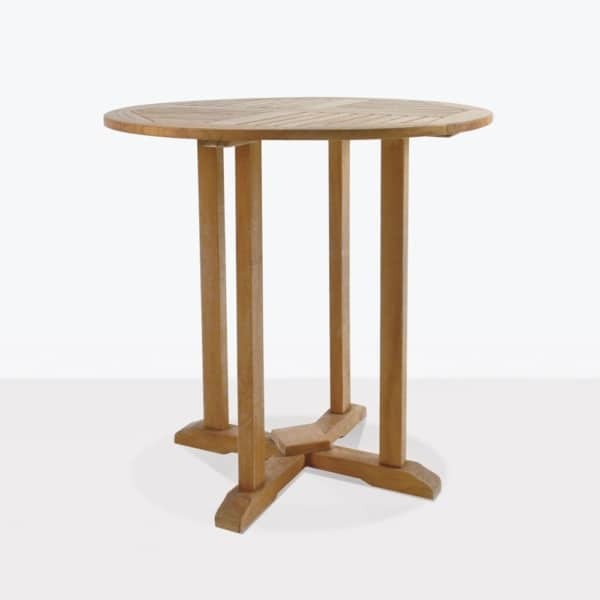 Classic, attractive, sturdy, and available in 3 accommodating sizes; our Round Bar Tables feature a traditional windmill design on the tabletop with a plugged hole for umbrellas if you need extra shade, all on a thick teak frame, making the Round Bar Tables one of our most popular items! Why? 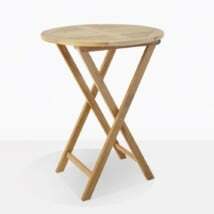 Because the stately, simple style never dates and the materials are top quality. 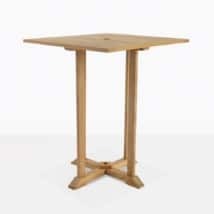 These robust teak bar tables are constructed using the finest A-Grade Teak, formed into a simple and elegant design that will suit both a modern or more traditional setting. At Teak Warehouse, we pride ourselves in using the best quality marine quality products, and A-Grade Teak is nothing if not marine grade. This is the wood you will see on the most lavish yachts and boats in the world and is prime material for your outdoor furniture. 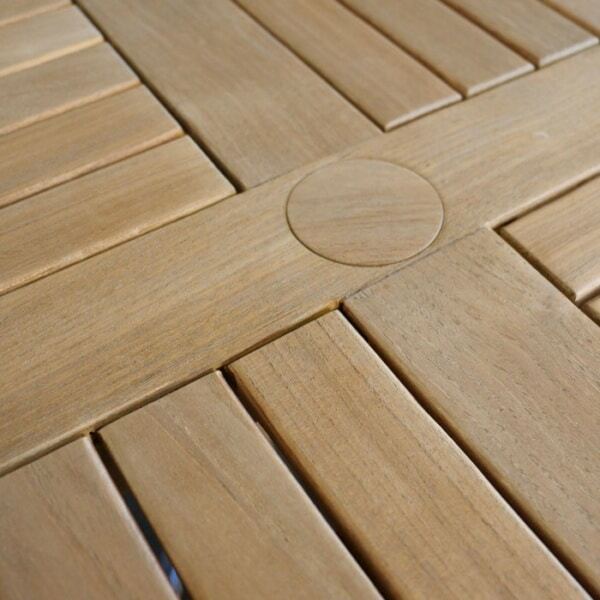 Our teak is kiln dried to perfection; feel the silken finish on the wood for yourself! The difference between A-Grade Teak and other grades is in the way it is produced. This plantation teak is cut down after 40 years, giving the wood extra high levels of naturally produced rubber and oil, meaning that the wood is ultimately stronger, more durable and extremely attractive. Pair up the Round Bar Table with a wicker bar stool to push the contemporary look, or place 4 teak arm chair bar stools around this for a heavy duty, sturdy and classic setting that you will love for years to come. Choose one of our many ranges of Sunbrella® umbrellas to cast some shade when you want to enjoy a few drinks outside on a hot day. At Teak Warehouse we are the experts in outdoor furniture, we will over an experience that you won’t receive anywhere else. 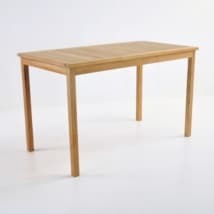 Our range of quality outdoor furniture at competitive prices will have you spoiled for choice! Call us now to determine different options that will suit your home. 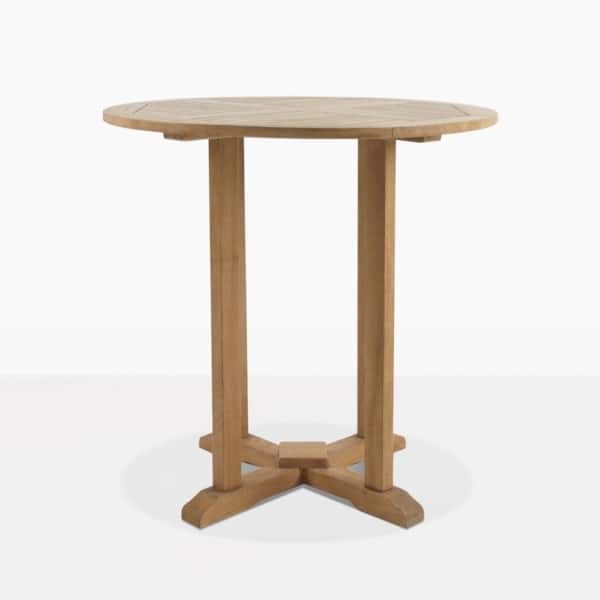 The Round Bar Table is a superb choice for your patio, garden or Barbecuing area. This robust teak bar table will be a regular fixture for you and your friends when summer rolls in!